The Plateau state governor says all prominent APC members who failed to attend the rally had offered cogent excuses – Lalong says it is no big deal to not have Tinubu present at certain rallies Governor Lalong said on Monday, November 21, that the South West All Progressives Congress governors who were absent at the Saturday APC Mega Gubernatorial rally in Akure, Ondo, had sent in their apologies and given cogent reasons for their absence. Ex-governor of Lagos state was notably absent, as President Buhari led the APC to a grand rally in Ondo state. He said that the national leader of the party, Tinubu, was not at the rally due to ill-health. Lalong, who is the Chairman of Ondo APC Governorship Campaign Council, made this known to State House correspondents after a closed door meeting with President Muhammadu Buhari in the Presidential Villa, Abuja. The Akure APC rally, which was witnessed by President Muhammadu Buhari, Senate President Bukola Saraki, and other prominent members of the party, was attended by only Governor Ibikunle Amosun of Ogun from the South West. The APC governors from Imo, Kano, Kogi, Jigawa, Nasarawa and Edo states attended the rally. The governors of Lagos, Oyo and Osun states, Mr. Akinwumi Ambode, Sen. Abiola Ajimobi and Mr. Rauf Aregbosola respectively, as well as former governor of Lagos State, Asiwaju Bola Tinubu, were also absent at the event. Governor Lalong, who was accompanied by the Minister of Mines and Steel Development, Dr Kayode Fayemi, however, explained that all the prominent APC personalities who failed to attend the rally had offered useful and convincing explanations. He said that the national leader of the party, Tinubu, was not at the rally due to ill-health. He said: “We explained their absence. They sent in their apologies. You heard what happened there. “As far as we are concerned, the President, who is the leader of the party, was at the rally. The national chairman was also there, as far as we are concerned, everybody was there. “If a leader was not there and he said he was not there because of ill-health, we prayed that God will heal him.” Lalong said he was in the Villa to thank the President for attending the Ondo rally. 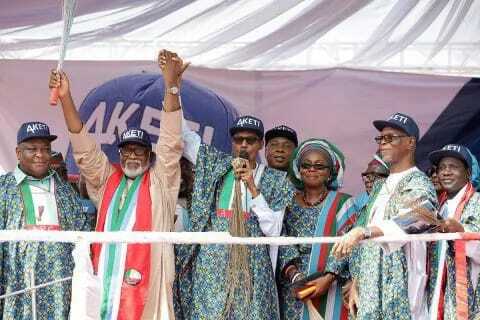 He said: “We have come to thank the President for going to Ondo for the grand finale rally.’’ Tinubu, who is being addressed as National leader of the APC, had opposed the emergence of Rotimi Akeredolu as APC governorship candidate in Ondo. He, therefore, demanded the resignation of the national chairman of the party, Chief John Odigie-Oyegun, whom he said had derailed from the path of progressives. Odigie-Oyegun, however, dismissed the call, saying the party’s primary election was free and fair.